Hotels of Truskavets is located in the center of the resort. Near by there is resort "Truskavets", where it is possible to buy sanatorium voucher. It is 5 minutes to the nearest pump-room. Villas and hotel of Truskavets is something special of the town-resort. Hotel "Forest Song" is an architectural ensemble of Truskavets. It is building in 1912 and is an architectural monument protected by the state. Villa "Forest Song" is a three storey building with beautiful facade and sophisticated interior and has 14 rooms, the cafe-restaurant "The Iron Horse" for 36 places and the reception. Treatment and diet offers to our guests on the basis of "Truskavets" resort which is locate near by the hotel. Hotel "Forest Song" offers rest in Truskavets in comfortable double, triple rooms of the following classes: one room standard (area 16 sq.m. ), one room improved standard (area 20 sq.m. ), two rooms "junior luxury suite" (area 30 sq.m. ), two rooms "luxury" (area 36 sq.m.). • cold and hot water 24 hours. Cost of accommodation in Truskavets resort in 2017 at the hotel "Forest Song". № 1, 6 Standard покращений 390 грн. Hotel "Forest Song" of Truskavets resort offers three meals a day in the resort which is located near by. It is also possible to order meals at the restaurant "The Iron Horse" according to the menu. • service of the rooms. Hotel in Truskavets "Forest Song" welcomes you to rest! Truskavets 2012 - 2017, hotel "Forest Song"
Standard The room has single or double beds, TV, refrigerator, bathroom. Standard superior The room has single or double beds, TV, refrigerator, bathroom. Family 2 bedrooms, living room, bathroom. The room has single or double beds, soft furniture, TV, refrigerator. Junior Suite Room with living room and bedroom with twin or double beds, soft furniture, TV, refrigerator, bathroom. Suite Room with living room and bedroom with twin or double beds, soft furniture, TV, refrigerator, bathroom. 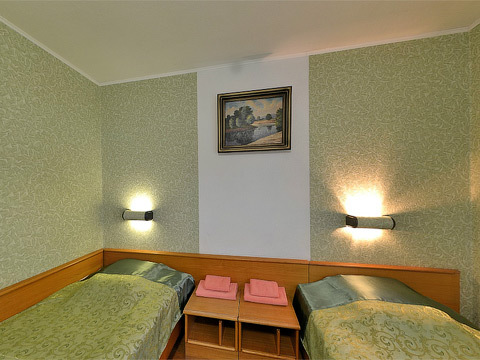 Virtual tour, Truskavets hotel "Forest Song"